There is a lot of myth and conjecture as to the varying potency levels of Trichocereus cacti and the reasons for it. Often anecdotal evidence does not match the published literature and just as often the published studies are taken as gospel for entire varieties of the Trichocereus species, despite a very limited sample size having ever been tested. Let’s take a look at all the factors involved and try and get to the bottom of this. First and foremost is genetics. Trichocereus pachanoi, peruvianus, bridgesii, macrogonus, scopulicola, terscheckii, valida, werdermannianus, taquimbalensis, tacaquirensis, pallarensis, santaensis, puquiensis, riomizquensis, uyupampensis, cuzcoensis, fulvilanus and schoenii have all tested positive for mescaline. Of these species, the most promising appear to be Trichocereus pachanoi, peruvianus, bridgesii, macrogonus, scopulicola, terscheckii, valida, werdermannianus, taquimbalensis, tacaquirensis, pallarensis, santaensis, puquiensis, riomizquensis and schoenii, having all tested above merely a trace amount of mescaline. Other plants that have not been tested also show potential based on bioassay and very similar morphology to the other known mescaline containing Trichocereus cacti, such Trichocereus escayachensis, huanocoensis and the plant known as T. Cordobensis. Although T.cordobensisis is not a recognized name, it may be a variety of T. scopulicola, or possibly Ritters T. crasicostatus which he described as being a longer spined scopulicola type plant. But now it gets a little trickier. Amongst the proven mescaline containing Trichocereus the actual amount of mescaline can vary wildly. Even in different parts of the same plant, let alone across a seed batch or the variety. Different subvarieties of pachanoi for instance have tested at up to 6% and whilst others test as low as zero. So just having one of the known mescaline containing varieties such as a pachanoi does not guarantee a potent plant. But at least it gives us somewhere to start. Luckily the traditional use of these plants, and the ever growing popularity of entheogenic cacti, has led to a growing body of anecdotal evidence that can help us narrow things down a little. Generally speaking, the most popular of the Trichocereus cacti for entheogenic purposes have been Trichocereus pachanoi, peruvianus and bridgesii. Although the consensus regard Trichocereus scopulicola, macrogonus, terscheckii, and cordobensisas being of near to equal potency. Others may very well also be but bioassay reports are lacking and far more research needs to be done, particularly of the rarer varieties that show a lot of promise such as Trichocereus valida. So this leaves us with Trichocereus pachanoi, peruvianus, bridgesii, scopulicola, cordobensis, macrogonus and terscheckii. From here, for purely ethno-botanical purposes we can eliminate Trichocereus terscheckii in the west as it is has a much slower growth rate than the others and is therefore much less suited for ethno-botanical use. Unless, of course, you are lucky enough to live in the Bolivian Andes and have an abundant supply locally. Please do not let this discourage you from growing Trichocereus terscheckii (nor any of the other Trichocereus), as they are magnificent plants in their own right and are well worth growing simply for their beautiful, serene presence alone. They are just not as suited to the purposes we are discussing here. Now that we have narrowed down our list to a few popular and renowned species, we have to look a little closer. As previously stated just because you have, for instance a pachanoi, it does not necessarily mean that you have a potent plant. So how do we tell if we have a potent plant? Well there’s one tried and true method, make a brew! But obviously this does not help us when we are purchasing a plant in the first place. And no one wants to drink a disgusting tasting brew that will have little to no discernable effect, especially with the likely puking involved. You really want to avoid that if at all possible. Each variety presents its own problems but some much more so than others. Generally speaking Trichocereus bridgesii, macrogonus, scopulicola and cordobensis all seem to be the most consistently potent plants with pachanoi and peruvianus varying wildly. This can often be explained by the confusion surrounding their taxonomy. A very wide variety of very different looking plants have all been classed as pachanoi, peruvianus and also for that matter with macrogonus. Whilst bridgesii, scopulicola and cordobensis all look to be relatively homogenous in their appearance by comparison. Luckily despite the many very different looking subvarieties of macrogonus, they all appear to be relatively potent. This seems to be the general consensus. I’ve never personally come across a report of an inactive macrogonus (nor bridgesii, scopulicola or cordobensis for that matter) but of course it is quite possible. Most subvarieties of macrogonus being sold are almost, if not identical to the originally described peruvianus from Matucana that has proven to be consistently potent. These are the fat blue peruvianus with the large areoles. They are quite hard to mistake and amazingly beautiful. The other main type of macrogonus you see is more akin to the originally described macrogonus being fat, brilliantly blue but with much smaller areoles. This type also seems to be consistently potent. There are a few other types of macrogonus getting around in particular from Karol Knize but their correct identification cannot be assured as Mr. Knize has an extremely bad reputation for ripping people off, misidentification and mislabelling. Also from the pictures I’ve seen of his set up there is absolutely nothing to stop cross pollination. This applies to any Trichocereus you see named with a “KK” attached to it and as so, has to be regarded as extremely suspect. That is not to say that he always gets it wrong. Quite often he is right in his identification and has made an extremely significant contribution to the world of cacti in general. I for one love his plants even though I have no idea what many of them actually are. As a general rule, it’s a good idea not to eat anything you cannot confidently identify. This problem particularly applies to Trichocereus peruvianus and to a lesser extent Trichocereus pachanoi. A large number of the peruvianus and pachanoi subvarieties being sold originate with Karol Knize. Does this mean we eliminate Trichocereus pachanoi and peruvianus? No. It just means you have to get the right ones, this is where being able to identify certain traits becomes important. With Trichocereus peruvianus the main thing you will have to be able to identify is the difference between the originally described plant (being the subvariety found around Matucana in Peru) and the more Trichocereus cuzcoensis type plants. There are numerous natural intergrades and hybrids as well as the problems presented by hybridization in horticulture. Also many regard Trichocereus cuzcoensis as a subvariety of Trichocereus peruvianus and as so sell it as such. But as a general rule once you can identify a genuine Matucana type peruvianus you will not mistake it for anything else. The Matucana type big fat blue plants with the large areoles have consistently proven to be potent. There are also a number of other regional varieties that have a very similar appearance. These are also generally considered to be consistently potent. With Trichocereus pachanoi we encounter a similar problem. The main thing you will have to be able to identify is what is known as the “PC” or predominant cultivar pachanoi which is widely regarded to be extremely weak in potency. 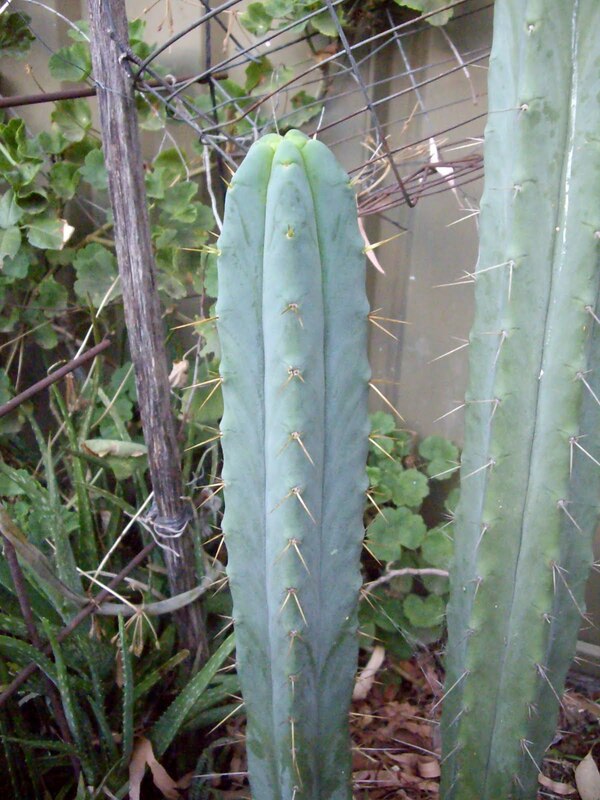 It also has been known as the Backeberg clone (despite showing littlein common with the plant Backeberg considered as being pachanoi that is pictured in his book Die Cactaceae) and as the “pachanot”. I personally do not like this name as it seems to me to be a little misleading. It is the predominantly cultivated pachanoi type and has always been considered a pachanoi by the experts. My investigations lead me to believe that it is the “FR 567” pachanoi collected by Friedrich Ritter in the Chan Chan Valley, Ecuador. The problem lies in that the particular subvariety no longer appears to be extant in the wild and that it displays white hair on its flowers where the originally described plant by Britton and Rose was observed to have black hair on its flowers. In fact, the “PC” pachanoi does actually have black hairs on its flower. It is just that they bleach white in the sun quickly, where as other subvarieties usually do not or at least not to the same degree. I’ve personally observed other plants considered to be pachanoi that are quite distinct from the “PC” pachanoi also having white hair on the flowers after having been bleached in the sun. Unfortunately, there is no one distinguishing feature that separates the “PC” pachanoi from the other subvarieties of pachanoi. But, it is reasonably easy to distinguish from the vast majority of other plants also considered to be pachanoi. It is much skinnier than the average pachanoi, but so are a few other subvarieties that are in fact quite potent. As a general rule though the fatter the pachanoi is, the more likely it is to be potent. Also the “PC” pachanoi seems to be far less likely to throw long spines as it ages, as many other pachanoi subvarieties do. It is a pretty distinct plant that with practice you soon will be able to easily identify. There are other pachanoi subvarieties that are also not potent, but they are much rarer than the “PC” which is literally everywhere. Often these can be found in older gardens and appear very similar to “PC” but with slightly larger spines and a more peruvianus type body. They are very distinct from the wild long spined pachanoi types that display a peruvianus like body which have proven to be consistently potent. In fact, it is these long spined wild type pachanoi that generally have been tested to have the highest mescaline content of all Trichocereus. But mescaline content is not the only factor involved in Trichocereus potency. There are other factors in play, such as the mono amine oxidase inhibiting alkaloid hordenine and the mono oxidase inhibiting flavonoids quercetin and kaempferol. MAOIs act by inhibiting the activity of the monoamine oxidase enzymes in your stomach, thus preventing the breakdown of mono amine neurotransmitters, such as mescaline, and thereby increasing their availability to the blood stream, and therefore brain. Effectively increasing the potency greatly. Hordenine has been observed widely across the Trichocereus species, but has only been observed in Trichocereus pachanoi of the plants we have narrowed ourselves down to here. Quercetin and kaempferol have been observed in Trichocereus bridgesii. This would explain the large amount of anecdotal evidence that suggests Trichocereus bridgesii to be generally as potent, if not more potent than Trichocereus pachanoi in bioassay despite consistently testing much lower in actual mescaline content. Now, we have narrowed things down rather well. We can have a reasonable amount of certainty that if we acquire either a nice fat long spined wild type pachanoi, a beautiful fat blue type peruvianus, a bridgesii, a macrogonus, a scopulicola or a cordobensis that we will, in most likelihood, have a nice and potent plant. But of course, it is no guarantee. From a seed batch of any Trichocereus there will be some degree of natural variation. This will also apply to the potencies of each plant. Now, if you had wanted to find out which of your plants is the most potent and cultivate it further (please do this people), one would have to try each individual plant. This will be a time consuming project, dependant on how big the seed batch is. But well worth it! As known quality genetics is invaluable for our purposes in the ethnobotany community. Hopefully, people will take this a step further and selectively breed even more potent Trichocereus than we currently have today. If you do not have the patience to wait a few years whilst a seed batch grows (as most people don’t) you can narrow things down even further by researching the named clones of each species. However, just because a certain clone has been named it does not always mean that it is a potent plant, or even particularly different from the average whatever it may happen to be. With a little research, information about the potency of different named clones can be easily found online in the various ethnobotany related forums. Or you can simply ask the wider community in one of the said forums. The Trichocereus Cacti Appreciation Group is the largest and best such forum on facebook. Quite often they are excellent sources of acquiring plants. Especially plants that have proven themselves to be consistently potent. Now that we have our nice, consistently potent Trichocereus cacti, we can look at the ways to maximize its potential. Trichocereus cacti have been found to be far more potent in winter than at other times of the year (in sub tropical conditions). During the colder months, in sub tropical conditions, they stop growing and concentrate their energy on their natural defence system against pests, the alkaloids. During this time, the plant is being stressed by the environment, which is a key factor in Trichocereus potency. Depending on conditions, a Trichocereus can be naturally stressed in numerous ways, including extreme sun, heat, cold, lack of water and nutrients, pest and disease damage, having its stress response triggered by the release of stress hormones into the air, such as methyl jasmonate, by other plants in the direct environment, falling under its own weight or numerous other potential scenarios. The important thing is the stress to the plant, or more importantly the plants natural defence mechanism, so that it will produce more of the alkaloids, such as mescaline. There are also numerous ways a person can induce the stress response of a Trichocereus artificially. Such as mimicking the environmental stresses it would encounter naturally – by withholding water and nutrients, spraying the plant with methyl jasmonate (jasmine flowers are a great source) , giving it more sun, etc. You can also physically damage the plant to induce the response by cutting repeatedly, but this also risks the chance of gaining an infection or having rot set in. The last thing you want to do is lose your newly acquired potent plant, so I do not recommend doing that. One also has to remember not to over stress a plant in an effort to increase its potency. This can cause susceptibility to disease and pests, if the plant is in too weakened a condition. Also it will drastically affect growth rate, which must be balanced if you want to have any cactus at all to use. The best way of going about this is to only stress the plant for a short period of time (no more than a few weeks) before harvest. And to then follow the traditional method of preparing the cutting. Or simply take the cutting during the dead of winter, if you are in sub tropical conditions, when the plant has stopped growing itself and has been naturally stressed for some time. Traditionally, taking advantage of the plants stress response has been achieved by taking the cutting to be used and leaving it in a dark place for an extended period of time before consumption. A Trichocereus cutting, after a certain amount of time (varying from plant to plant by weeks to sometimes months), will begin to once again devote its energy to growing instead of producing more alkaloids, despite not being rooted in the ground. It will also in time send out roots in the search for water. The point of optimum alkaloid production will be just before the plant begins to grow again, and should be used at this time for its greatest possible potency. And yet, as seems to be only natural for our species, we can always take things even further. A great way to potentiate a Trichocereus brew is to add a variety of admixture plants and substances, such as in the traditional Cimora brews. The already mentioned flavonoids, quercetin and kaempferol, are widely distributed in the plant kingdom and can be found in high quantities in the following easily obtainable plants: tea (Camellia sinensis), capers (Capparis spinosa), onion (Allium cepa) and Gingko biloba. Other flavonoids and coumarines also show promise as safe reversible short term monoamine oxidase inhibitors, thusly having the potential to increase potency. Other monoamine oxidase inhibitors, such as those found in the Ayahuasca vine harmine, harmaline and tetrahydroharmine, can also be used to effectively increase potency. Caution should be advised when using any MAOI and please take the time to do the research about their effects, potentially dangerous side effects, and counter interactions. Many other types of plants and substances that are widely available will also have a potentiating effect on a Trichocereus brew. Generally speaking, almost any psychedelic plant or substance, such as Magick mushrooms, Ayahuasca, Hawaiian baby woodrose seeds or Iboga, taken in conjunction will greatly boost its effects. Also, stimulants such as coffee and Khat, as well as dissociatives such as nitrous oxide and ketamine, show great promise in this regard but should be treated with all due care and caution. The tropane alkaloid containing plants, such as Datura and Brugmansia, have often been traditionally used to potentiate the effects and to also mitigate nausea. Tropanes are especially dangerous and should under no circumstances be used without proper research into their potential dangers and safe dosage levels. Eighty five percent or more dark chocolate goes particularly well in combination. As does marijuana, which has the side benefit of also helping to mitigate nausea. Which brings us to probably the most unfortunate side effect (depending on your point of view) of a Trichocereus brew, namely nausea and the resultant purging. Purging is traditionally considered to be a positive part of the experience, in that it is divined to be an expelling of demons or negative energies and such things of that sort. Considering it that way could also be just a mental trick we play on ourselves to help us get past what is, let’s face it, a rather uncomfortable thing to have involuntarily happen to us. But that is outside the scope of this article. The reason I mention this is because when you purge you’re potentially wasting a large amount of the active ingredients that could have been absorbed had they stayed in the digestive system. As previously stated the tropane alkaloids and marijuana help to relieve nausea greatly, making it possible to avoid the awful feelings of nausea and purging, as well as potentiating the psychedelic effects. Lemon essential oil also works well in this regard. It works by effectively blocking or antagonising the 5-HT3 receptor that is largely responsible for triggering feelings of nausea when agonised by serotonergic psychedelics, such as dimethlytriptamine and mescaline. This also frees up more mescaline to bind to the 5-HT2 site in the brain that is largely accredited with being responsible for the psychedelic experience. Suppressing nausea and therefore purging could however be potentially dangerous and will most certainly increase any risk of overdose. Diet can also play a role in how effective, or potent if you will, a Trichocereus brew will be. Preloading the body with a mostly plant based diet high in the MAOI flavonoids quercetin and kaempferol will greatly boost a brews effectiveness. Such as is often used in the “dieta” undertaken before the use of Ayahuasca in traditional cultures. Also, fasting on the day of consumption will make a substantial difference. Any psychoactive will be more effective when taken on an empty stomach. Lastly is, of course, dosage. The potency of your brew (once having a bona fide potent plant) will now largely depend upon how much you actually use. This will also obviously apply to any admixture plants one may happen to use, and also to how much they potentiate the active ingredients. As a very basic general rule, around one foot of cactus is usually required for a reasonable dose. However, as we all have different physiologies and reactions to plant medicines it is a wise idea to start off at small doses and work your way up. Learn your body and your reactions to the medicine. From there you can then start to utilize admixtures and start to tailor your experience as so desired. The more experience you gain working with these plant medicines the more you will know the correct dosage levels required for your system. Please keep in mind that this article is only intended as a general guide and starting point for further research and experimentation. Set and setting should also obviously be taken into account and all due care and preparation should be undertaken before experimenting with these plants. These plants are potentially dangerous, particularly in combination,and must be treated with the utmost respect. Also, in many countries these plants and/or ingesting them may be illegal, despite being utilized perfectly safely by traditional cultures for millennia. An amazing discovery has been made in the Atherton Table lands region (near Cairns) of tropical far North Queensland, a family of shrubs and small trees thats flowers, seeds, leaves, roots, wood and bark contain a compound that kills cancerous tumors in a matter of mere days, with no long term side effects. Plants in the Fontainea family, especially Fontainea picrosperma/Hylandia dockrillii, and Fontainea venosa, more commonly known as the Blushwood tree or shrub, has been shown in animal studies, as well as in initial human studies, to be remarkably effective against solid tumors such as melanoma, head, neck and breast cancers, some of the biggest killers in the world each year. The problem is, these much needed miracle plants are largely endangered in the wild, with only a few small pockets being known of for some, and the only propagation of these amazing plants is currently under the control of the pharmaceutical industry. The initial discovery was made by Dr Victoria Gordon and Dr Paul Reddell of EcoBiotics in 2006, who observed that marsupials find the seed of Fontainea picrosperma/Hylandia dockrillii unpalatable due to an inflammatory chemical present in reasonably high concentrations. Gordon and Reddell sent off a batch of crushed kernels to a commercial lab in Sydney to investigate any possibly useful compounds, finding powerful anti cancer properties in a compound named EBC-46 and powerful wound healing properties in a compound named WH-1. Scientists at the QIMR Berghofer Medical Research Institute in Brisbane, led by Dr Glen Boyle tested the compound EBC-46, on a tumour cell line and were astonished by its effectiveness. When applied to a laboratory mouse implanted with human skin cancer, the melanoma turned red and purple, then melted before their eyes. Evidently, the Blushwood shrubs amazing healing properties do not stop there, it also kicks up the bodies natural healing response, healing the wound with soft, new skin and reduced scarring.“Some of the wound healing we’ve witnessed so far in pilot studies with pet dogs has been remarkable. These animals had chronic non-healing wounds that weren’t responding to current standard of care treatments before being treated with our new compound,” said Dr Gordon. “Based on these extremely encouraging results we are now moving to more fully evaluate the prospect of developing this drug as a treatment for both chronic and acute wounds. Wound healing is a large market ($14 billion annually in the USA alone) where there is significant demand for new and effective products for application in both human and veterinary medicine,” said Dr Gordon. Of the 344 animals treated to date about two thirds of them dogs 78 per cent ended up cancer free or with tumor mass reduced by more than half. Fewer than nine per cent failed to respond. Bone cancers and highly fibrous tumors have so far proven to be resistant, possibly because not enough EBC-46 can penetrate into the cancer. EcoBiotics is also progressing with its plans in international veterinary cancer markets, following approval from the US Centre for Veterinary Medicine for further studies on the treatment of canine mast cell tumours with EBC-46. This approved study will involve 10 investigative sites and 120 cases for the treatment of canine tumours, and would be the final clinical step to use of the product in the US for canine mast cell tumors. Dr Gordon said once the study was completed, the company would seek regulatory approval from the Australian Pesticides and Veterinary Medicines Authority to make the drug commercially available to the domestic vet market. Multi-centre human Clinical Phase I/II trial, which started in 2015, are showing encouraging results. According to Dr Gordon, the study has now treated eight human patients. “This study is primarily being undertaken to examine the safety of EBC-46,” Dr Gordon said. “The drug has been well tolerated by all patients treated. In addition, sound evidence of efficacy has also been noted in tumors of all the patients treated. This is shown by the appearance of bruising and initial tumor breakdown on the section of the tumor treated. This response in humans is very similar to what has been seen in the successful veterinary studies with EBC-46 where full tumor destruction is noted.” Tumor types in the human trial treated to date are melanoma, squamous cell carcinoma, basal cell carcinoma and breast adenocarcinoma. Denise Powell, one of the cancer sufferers who has joined the trial in Queensland, had a tumor in her armpit that was getting progressively worse, “My cancer surgeon said, ‘I can take that one out, if you get any more you might lose an arm.” Doctors injected the trial drug EBC-46 directly into Denises tumor, “In less than 20 minutes the tumor had gone purple then black,” Denise said. “Then within a couple of days the tumor just kind of shrivelled up and died”. Dr Gordon said none of the patients, who were treated at hospitals in Brisbane, Sydney, Melbourne and Adelaide, showed any negative side effects from the drug. “These initial results, that are clearly showing potential for a good safety profile for the drug combined with early signs of efficacy in a range of tumor types, are very encouraging,” said Dr Gordon. “The exciting thing is the drugs are responding in exactly the same way in tumors in cats, dogs and horses. It’s proving our theory that it’s not species specific, and it’s not tumor specific either, because it’s actually working in a range of tumors.” She expected the drug, once it had been trialled on at least 11 more human patients, would become commercially available within the next four years. Encouraging to say the least. What is not encouraging however is the threatened status of these endangered plants and the way that this discovery has been reported so far in the mainstream media. Whilst this amazing discovery has garnered a small amount of press coverage, in every article in the mainstream media I could find, the only plant mentioned to be containing EBC-46 and WH-1 is Hylandia dockrillii, the Blushwood shrub. None of them mention that Hylandia dockrilli is synonymous with Fontainea picrosperma or that the initial study identified Fontainea pancheri, Fontainea australis, Fontainea borealis, Fontainea fugax, Fontainea oraria, Fontainea rostrata, Fontainea subpapuana and Fontainea venosa as containing EBC-46 and WH-1. With Fontainea picrosperma, or Hylandia dockrillii and Fontainea venosa found to be the most useful. Also they do not mention that numerous other compounds discovered in the fontainea genus also show remarkable promise in regards to killing cancer as well as treating other ailments. Now, this may have been simple over site, the writers editing down to fit word counts or perhaps an attempt keep the compounds EBC-46, WH-1 and the Blushwood shrubs relatively obscure from the public, therefore protecting the discovery for the‘big pharma’ industry. Whilst EcoBiotics and it’s subsidiary QBiotics (which is developing these compounds), are not ‘big pharma’ in themselves, being a small Queensland company, they will have to find a lot of funding if they are ever to get these compounds to market, which means selling the rights to the compound to the big boys. If EBC-46 gets through to Clinical Phase III, the critical proving trial that generally involves thousands of patients around the world (which it appears so far that it will, with flying colours), it will have burned through all of the cash EcoBiotics have raised, and more. The majority of their 1200 shareholders are mums and dads who have kicked in as little as $1500; the biggest single outside stake in the unlisted company is $1 million. This is more by accident than design. Dr Gordon initially did the rounds of venture finance providers but was rebuffed; prove it up and come back to us, the money men told her. The expense of getting a drug to market is staggering, which helps explain why so few get through in Australia. Picato, a rare success story, had $130 million ploughed into it by Danish outfit LEO Pharma before being registered by the Therapeutic Goods Administration last year. In a small pond, Australia’s CSL is the nearest thing there is to a big local fish. Yet to meet the development cost it had to license the international rights of Gardasil – the controversial cervical cancer vaccine pioneered by 2006 Australian of the Year Ian Frazer – to US giant Merck. Dr Gordon estimates that EBC-46 will require north of $600 million to be made into a medicine – completely out of their league. She and Reddell have structured the company so that the subsidiary, QBiotics, contains the intellectual property and could be peeled off for outright sale or a stock market float. Which is most likely what will end up happening seeing the extraordinary promise of the Blushwood extracts EBC-46 and WH-1. The rights to these compounds ECB-46 and WH-1 may be owned by Ecobiotics through their subsidiary QBiotics, but they do not own the plants they are derived from. They certainly do deserve credit and to do extremely well out of their discovery and hard work. I in no way wish to disparage the truly fantastic work Dr Victoria Gordon and Dr Paul Reddell of EcoBiotics have done and genuinely do hope that they get these compounds to the market, as they are sorely needed no matter how it happens. What I do not want to see however is only ‘big pharma’ growing these plants and controlling access to them. This is where I hope the intrepid readers of New Dawn magazine and Tricho Serious Ethnobotany can help out. I would like to call upon the New Dawn and Tricho Serious Ethnobotany readers in the areas where these plants grow, to actively hunt down these plants in habitat and procure seed and or cuttings, so that these amazing life saving plants themselves can be saved, for all of us. The nine currently known species of Fontainea grow naturally in Queensland and New South Wales (6 sp), New Caledonia and Vanuatu (1 sp), and Papua New Guinea (2 sp). Some species are commonly named Blushwood, but not all and fruit from spring through to autumn. One species, Fontainea oraria, the coast Fontainea, is known only from 10 living plants growing on private property near Lennox Head in northern New South Wales. Its status is critically endangered. Locating the two most promising species Fontainea picrosperma/Hylandia dockrillii and Fontainea venosa should be relatively easy with Fontainea picrosperma/hylandia dockrillii being located in and around the Atherton Tablands near Cairns and Fontainea venosa being located in South East Queensland around the Gympie area. Exact habitat locations for Fontainea picrosperma/hylandia dockrillii can be found in the resources section following this article. It should be noted that experimentation with any parts of these plants is potentially dangerous, although the researchers are adamant that the drug has potential to be used internally as well as the current external treatments, the necessary work is yet to be done. “The sting in the tail is that it has to be put on the outside of the body,” explains QIMR Berghofer director and CEO Frank Gannon. “It is highly toxic if it gets into the body unless it can be controlled”. Also there has been absolutely no study on what a raw plant extract would do, if anything at all and may be very dangerous if ingested considering the inflammatory response it triggers, which first led to its discovery. In conclusion, these endangered miracle plants need us to protect them, spread them around and study them. We simply must not allow the only access to these plants to be through a big pharmaceutical company that cares only for profit, not people. The fact that these endangered plants have proven to be so effective and relatively safe, worries me greatly. We run the risk of having this amazing discovery being simply bought and shelved, as cures are not as profitable as “treatments”, such as the ineffective but lucrative chemotherapy “treatments” that slowly milk your wallet before killing you. We have pushed these plants to the brink of extinction through habitat encroachment, whilst the disease they cure is ravaging our population worldwide, maybe we don’t deserve such miracle plants such as the Blushwood shrubs, considering our treatment of the Earth and her bounty, but it is not too late to put people before profit. If you are able to procure seed or live plants please feel free to contact Brett at bretloth@gmail.com. About the author: Brett Lothian is an Australian author, professional arborist, market gardener and ethnobotanist. He is the author of the Tricho Serious Ethnobotany blog and creator of the Trichocereus Cacti Appreciation group, the Peyote Appreciation group and the Ethnobotany Appreciation group on facebook.